When Northern first opened its doors in 1913, the first student admitted was a woman. Amy Lee Stockton (pictured bottom right) was a bold, passionate servant of Christ who knew her calling to be a leader in the church. 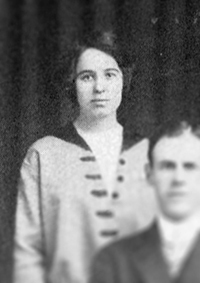 Women in the United States did not gain the right to vote until 1920, and here was young, vibrant Amy, attending Northern Seminary, preparing to be a minister of the gospel. Now fast forward 100 years, and imagine again a compassionate, shepherd-servant, who is also a multi-gifted military officer with two black belts in martial arts, who preaches sermons, and who leads a host of church ministries! That’s Chaplain Captain Mary Scheer (pictured above), U.S. Air Force, Air National Guard, and pastor, Brewster Baptist Church. Mary was inspired to pursue her calling at Northern despite real obstacles. Several years and one M.Div. later, she and her family were called to Brewster Baptist Church where she serves as pastor, and in her second area of ministry, Chaplain Captain, United States Air Force and Air National Guard. Mary says her chief responsibility is providing pastoral care and counseling. She remarks, “Every aspect of my life has been shaped by someone else’s willingness to serve others.” Mary believes that she owes her time to furthering God’s work in this world because so many loved and encouraged her while attending Northern. Two remarkable women, in two different centuries, following Christ and allowing Him to use their gifts to touch the world.